I like to ride. Practicing standing still is not so much fun for me. Nevertheless, in order to have a good showing in Ranch Conformation, one ought to be prepared. So, I decided to practice standing correctly at the end of every training session, when I am getting ready to unsaddle. This worked well for me because we have finished riding so I am not anxious to get on and enact my brilliant training plan of the day. There are multiple benefits to teaching this skill 1–It works for Ranch Conformation. 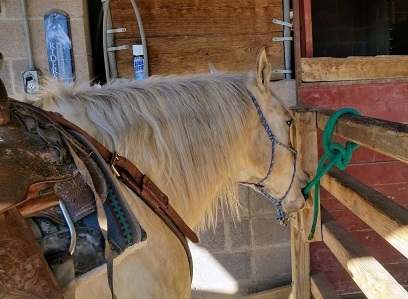 2–Atti likes to chew the hitching rail, the lead rope, etc., so making her stand up, away from all mouth temptations, has helped her to develop a bit more patience and I don’t have to nag her to “QUIT”. 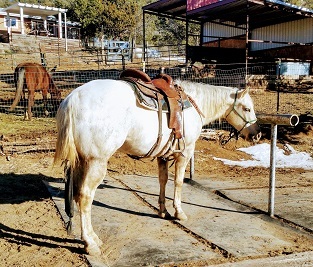 3–In Ranch Trail, the horse sometimes has to ground tie while the rider walks around them. If she knows to stand still, we can get this done! 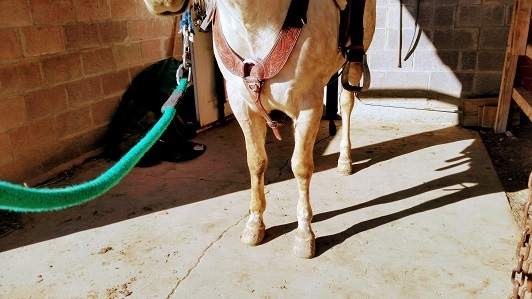 When beginning to teach this, it took a long time get her “square” –all four feet even at all four corners of her body– and then, as soon as I got it done, she would move, so we would have to start all over! Teaching a horse to square up should be done using a consistent procedure. Horses are very good at learning patterns, so if the set up is approached the same way each time, the horse can learn faster. Here is the pattern I use, which I did not make up, but learned from others. 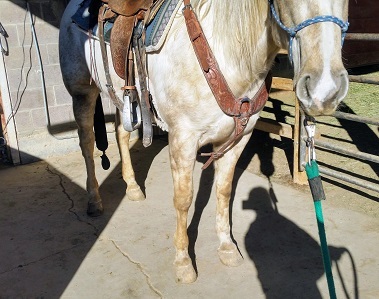 I set the back left hind, and then using my lead rope and halter, ask the horse to bring her right hind even with the left. At first this entails a lot of back and forth of the right hind and then re-setting the left and starting over. Then using the halter and lead rope I ask her to move her front feet so they are under her shoulders and even with each other. At first, I might accept not quite perfectly square, if the horse has tried, is close and stands still! Once the horse gets the square up pattern down, it starts to go very fast. In fact, if I try to tie Atti up to unsaddle instead of squaring her up, she actually objects, and goes to her square up spot! So square she is a tripod. As with most aspects of horse training: do it, rinse, repeat, and don’t get mad. If you put in the patient effort, you and your horse WILL get ‘er done. *The Ranch Classes: Ranch Riding, a pattern class; Ranch Reining, a modified reining pattern; Ranch Rail, walk, trot, lope around the arena with other horses in a natural frame; Ranch Trail, an obstacle course; Ranch Conformation, a class where the horse’s conformation is judged, hopefully with an eye towards a working type horse.